Even though the American economy took a hit in 2008, certain industries continued to boom, and all the efforts to "go green" as a nation paid off for environmental engineer technicians. According to the Bureau of Labor Statistics, this particular industry is expect to see growth of 30.1 percent between 2008 and 2018 - a rate much higher than the national average. If you're interested in a career which will help support your green activism, take a minute to learn what environmental engineer technicians do. Environmental engineer technicians are not environmental engineers. They work under the supervision of engineers to evaluate and remediate environmental hazards. In most cases this applies directly to the testing and operation of equipment and infrastructure that influences environmental waste and pollution. There are a number of different types of environmental waste and pollution, so environmental engineer technicians may work for government agencies, engineering companies, recycling plants or water treatment plants, just to name a few. Most organizations want to hire engineer technicians with at least an associate's degree from an accredited program. There are at least 700 accredited programs nationwide, and most programs are specific to a subspecialty of engineering, like environmental engineering. The Technology Accreditation Commission of the Accreditation Board of Engineering and Technology (ABET) requires that accredited associates degree programs include coursework in math, science and classes specific to the field in which the student wants to pursue. For instance, environmental engineering programs would include coursework in handling hazardous materials and environmental regulations. Individuals who receive an associate's degree in engineering technology can usually become engineer technicians after graduation. Just keep in mind that pre-engineering programs offered at junior colleges aren't the same as engineering technology degrees. Pre-engineering programs set you up to continue your education at a four year university. While there's absolutely nothing wrong with this, you will not be sufficiently prepared for an engineer technician position after you've received your associate's degree. If you only want to pursue two years of education, make sure you enroll in an engineering technology program. There are engineering technology programs offered at four-year universities, but most graduates from these programs end up taking positions as applied engineers, rather than engineering technologists. 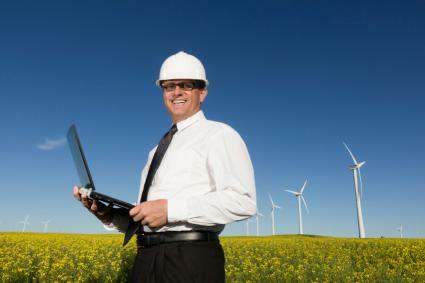 The environmental engineer technician's job description will vary depending on the employer and the agency's goal. Most environmental engineer technicians are the "front line" for ensuring pollution contaminants don't enter the environment. Their days may be spent inspecting facilities to ensure standards are being met, testing equipment and samples to make sure contamination hasn't occurred, and arranging for proper disposal of hazardous materials. Most positions require a traditional 40 hour work week. Depending on the job, technicians may spend their time on their feet touring facilities or in an office or lab performing tests and maintaining paperwork and records. Most engineering technicians work closely with engineers and scientists to help come up with new and innovative ways to help protect the environment. When you land a position, you can expect to make roughly $42,000 - the median salary for environmental engineering technicians. To command a higher salary, additional education and experience may be required.